Ex Candy Stripe, Josh Daniels celebrates his debut goal for Glenavon at Mourneview Park against Glentoran. JOSH DANIELS is loving life in the Irish League with his new club, Glenavon but he can’t help keeping a close eye on the fortunes of his hometown club. Describing himself as a ‘Derry City boy through and through’ the talented winger has been a familiar face in the stands at Maginn Park since departing the club last August. I’m making new connections and meeting new people. It’s like going into a different workplace where you meet different people and it’s widening my connections so I’m loving it. The 21 year-old Galliagh man spent five seasons with Derry City in the League of Ireland, playing under four different managers, but decided it was time for a fresh start and left the club before penning a two year deal with the Lurgan Blues a few weeks later. He speaks about his former manager and teammates in glowing terms and was delighted to see the Candy Stripes clinch qualification for the UEFA Europa League this week. And Daniels reckons the City players must be admired and deserve great credit for their achievement, given the hardships in the 2017 campaign. “I’ve been down watching all the home games since I’ve left and there was a couple of games where the boys lost their momentum but they’ve got it back rightly,” said Daniels. “People were writing them off after a bad run of results and when things aren’t going the way fans want it to go it’s easy to criticise. But you have to admire the work rate they’ve put in all year. “Derry lost to a couple of ‘lesser’ teams and have played really well against all the top teams. If they had of picked up a few wins in those games then they could be up sitting in second. The former Top of the Hill Celtic youth reckons his departure and the transfer of Mark Timlin to Finn Harps has opened the door for some of the younger members of the City squad who are making the most of their opportunities. “There are a lot of young boys who are getting call-ups for the U21 international squads which is an unbelievable opportunity to show what they can do. When I left, and when Mark Timlin and a few others left, there was a couple of vacancies and it has opened up gaps. “Fair play to the likes of Ben Doherty who has taken his chance. He was playing left back last year and he likes to play as a midfielder and is also playing left wing and he’s starting to get to show people his energy levels which have been brilliant in the home games I’ve seen him play in recently. Daniels wasn’t concerned about moving outside of his comfort zone and has bedded in to life in the Irish League quickly and comfortably, establishing himself as a regular in the Glenavon starting XI. In fact since his arrival at Mourneview Park, Daniels has played all but one league matches - missing the draw with Dungannon Swifts due to illness. He played another 90 minutes in Glenavon’s impressive 3-2 win over Crusaders at Seaview last weekend as the Lurgan Blues moved into second place in the Dankse Bank Premiership table. 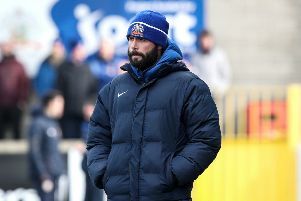 Glenavon boss, Gary Hamilton has put a lot of faith in the exciting winger and as the club enjoy a five match unbeaten run in the league, Daniels is ‘loving life’ at the club. “It’s a good set-up and I’m loving it,” he smiled. “It’s exactly what I wanted. I’m enjoying my football and loving life up here. I wanted a change and some people might think the long drive up to training might put you off but it hasn’t. “It’s put me out there more,” he added. “I’m making new connections and meeting new people. It’s like going into a different workplace where you meet different people and it’s widening my connections so I’m loving it. “I came up here with not many senior games under my belt. When you’re in and out of the first team it can be difficult to get straight into things, It took me a while to get back to full fitness. You can do as much full-time training in the world but until you play 90 minutes every weekend it’s completely different. “I’ve started four or five games and I’m starting to feel confident and sharp and I’m enjoying it as well. I’ve never started any more than four senior games in a row so it’s about keeping going and trying to get maybe 20 or 30 starts and give it a good go. “Gary (Hamilton) has shown a lot of faith in me and the staff at Glenavon have been great. It’s easy for me to fit in. I don’t know anybody up here but the football side of things are starting to take care of itself. Glenavon host Ballymena United this weekend at Mourneview and Daniels is hoping they can extend their impressive run and keep the pressure on leaders, Coleraine.